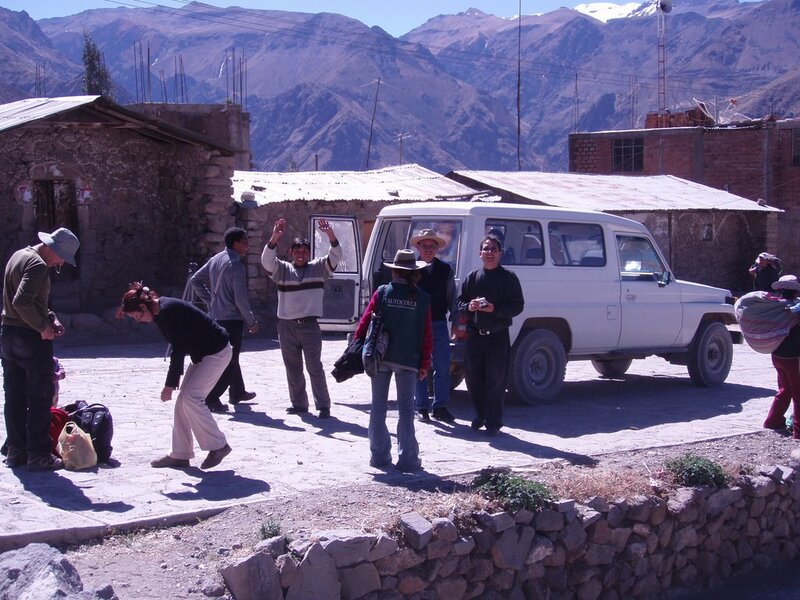 We took a bumpy, three-hour bus ride from Arequipas, a white-washed city with a Spanish-colonial vibe, to the dusty, desert-like Colca Canyon. The big draw? To spot condors up close. To see the world’s largest bird, we needed to get to Cruz del Condor, the park where they make their home in the cliffs. Cesar, our hotel’s manager, informed us we could either hire a taxi to take us at 7 a.m. the next morning for 100 soles (or around $30) or catch a 5:45 a.m. bus for 3 soles (less than a dollar). 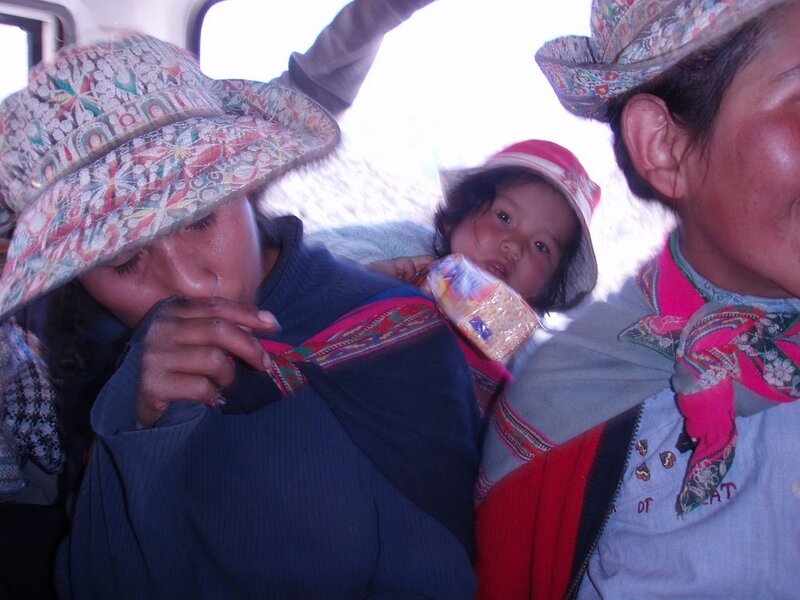 We decided on the cheap bus option because riding with the locals usually proves more adventurous. Um, we had no idea how right we were. Below is a timeline of our eventful day. 4:30 a.m. Cesar gives us a wake up knock and we drag ourselves out of bed, bleary-eyed after the previous day of travel to eat breakfast and wait for the bus. 6 a.m. Still no bus. 6:10 a.m. We must have missed the bus, so Cesar drives us into town to see if we can catch another one. As luck would have it, the next won’t arrive until 7, 7:30, 8 or 8:30, depending on which random person we ask. 6:20 a.m. Cesar drops us off at his friend’s restaurant- lodge so we could wait by the fire since it’s still freezing outside. Amanda practices sprinting out the front door, through the parking lot and to the road to flag down the bus when it passes. Jen times her on her stopwatch: 11 seconds. Nice job, Forest! 7:30 a.m. Amanda manages to flag down a bus. Hooray! If only Cesar had informed us a later bus was an option, we might have gotten two extra hours of sweet sleep. But at least we’re on the road. 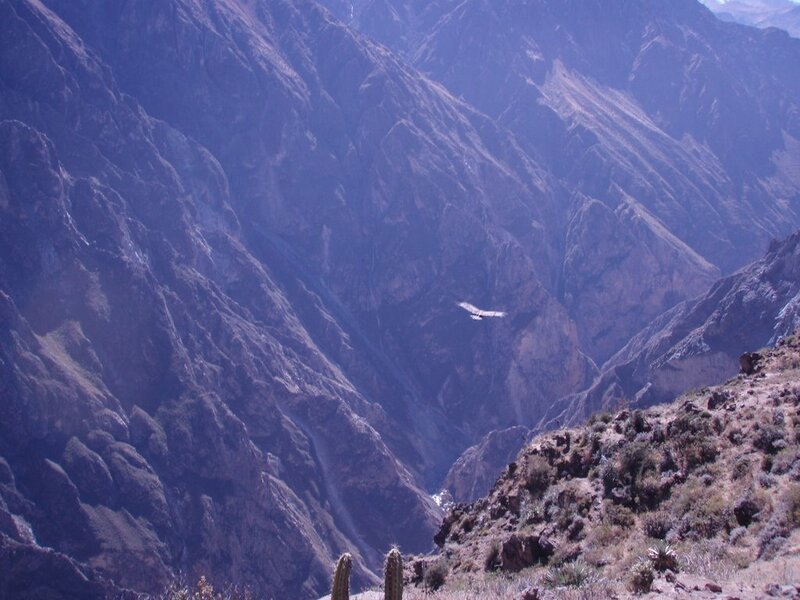 9 a.m. We arrive at Cruz del Condor and pay our 35 soles (about $10) to sit on the edge of a sheer rock face among dozens of other tourists and wait to spy the condors. 9:40 a.m. The crowd of tourists let out a collective “Ahhh!” as a bird with a wing span of about 6 feet soars dangerously close overhead. It circles and glides on the wind’s current like a fighter jet, then lands on a nearby rock outcrop and stretches its wings. Awesome! 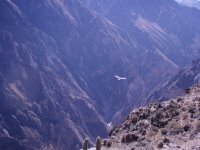 A second condor flies nearby and the first bird leaves its resting spot to meet it and gracefully soar in tandem over the canyon, then they disappear. 9:50 a.m. I notice all the tourist buses have vacated the once crowded parking lot and see two local buses pass by filled to the max with passengers. Shoot, we missed the next bus back! 10 a.m. A park attendant says the next bus is 12:30. The girls and I look at each other in panic-we have to wait out here in this blazing sun without water for 2 ½ more hours?! He’s got to be joking. 12:30 p.m. The bus is here! A dozen or so tourists stand in the middle of the road to block its path when it doesn’t slow down. The driver won’t open the doors for us and I can see why: People are packed inside tighter than the NYC subway at rush hour. They’re standing in the aisles, hanging out the windows and a few are even on the roof, holding on for dear life. 12:35 p.m. A riot is erupting as stranded tourists pound on the doors, demanding to be let on. 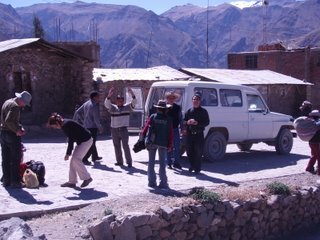 The driver says the next bus may be at 1 or 2 p.m. We decide to start walking to the next town. 1:15 p.m. We get out the video camera to record a message to our Moms in case we become dead meat (a.k.a. lunch for the condors). 1:20 p.m. Our prayers are answered when a priest driving a white van pulls up and lets us in. Thank God for the kindness of strangers! 1:25 p.m. We see two women with babies strapped to their backs walking under the blazing sun. We stop to give them a ride and I sit on Amanda’s lap so we can pack in. 1:47 p.m. We enter a dusty bodega to ask about a taxi, but it seems they don’t exist. Our only option, according to the cashier, is the unreliable 2 p.m. bus. 1:48 p.m. We email the hotel manager from a local school to tell him we’re stranded in this tiny town and don’t know how to get back. For lack of other options, we head back to the deserted square to wait for the bus. 2:00 p.m. Still no bus. We’re really stranded! We’re going to fry under this sun with no food and no taxis and one knows where we are. 2:30 p.m. Cesar pulls up in his white jeep. We’re saved! 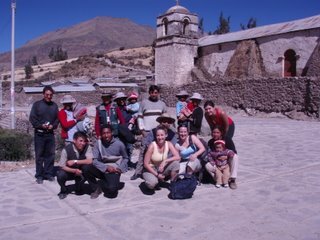 3:30 p.m. We arrive at our hotel 10 hours after we left for a 15-minute condor spotting, dusty, sunburned and exhausted-but all in one piece. A. Bus schedules are subject to change without warning, so having patience and an alternative plan is essential. B. It’s OK to rely on the kindness of strangers. C. Never go into the desert with out water. Excellent, sounds like you’re having a whale of a time. And you hit the nail on the head, never, ever go out without water. You will die!! And on that happy note – you still calling in Dubai for martinis? very cool story. Sounds a lot like a bus ride I once took in Morocco. 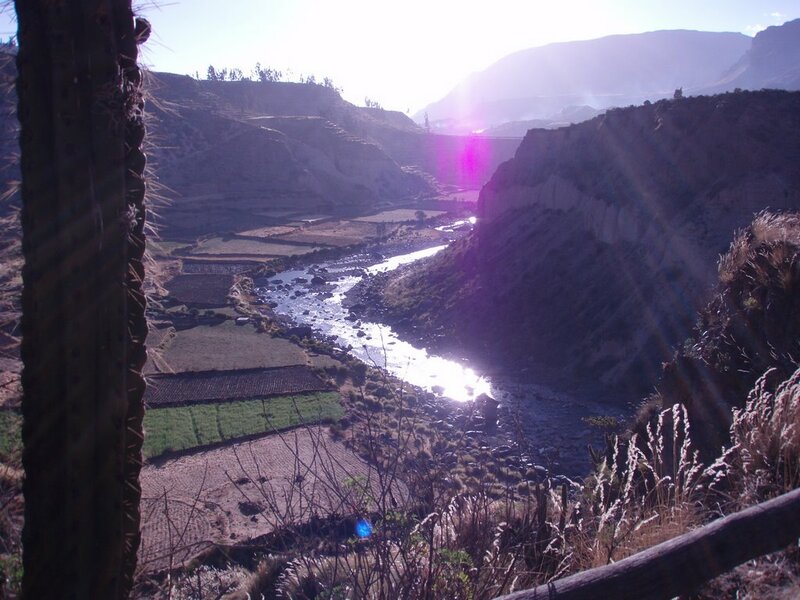 Now if you’re ever stuck with a 4-hour flight delay or some other first-world travel snafu, you can just think about the Colca Canyon and know that you’ve been through much worse.